What is your fee? What does the fee include? ​Most couples choose our all-inclusive package for $500 because it includes everything couples want from their officiant (optional premarital consultation & marriage resources, customized ceremony design, professional officiating, facilitating your rehearsal, legal submission of your marriage license, and local travel). Our ceremony-only package includes a customized ceremony, professional officiating, legal submission of your marriage license, a 1/2-hour online "walk-through" of your ceremony, and local travel for $350 (rehearsal and optional premarital consultation not included). ​Our all-inclusive package covers all of our services for you, including: personalizing and officiating your ceremony and rehearsal, providing and processing with you the optional Prepare/Enrich (P/E) online relationship inventory (tailored to your unique backgrounds) and P/E Couple Workbook, face-to-face or virtual consultation, local travel, and professional referrals. No surprise "extra" charges. A professional officiant is as important as your venue, photographer, caterer, DJ, florist, etc. Our all-inclusive package is the most cost-effective way for you to receive officiating services tailored especially to meet your unique needs. Plus we get to know one another before your wedding! Only you know what's ﻿best ﻿for you: all-inclusive for $500 or ceremony-only for $350. Let us know what will make it most special for you. Either way, 50% is due at booking as a non-refundable reservation fee and the other 50% is due one week before your wedding. Why do you include Prepare/Enrich, in your all-inclusive package, as a free bonus for couples and what is it? ﻿Because couples love it, have so much fun with it, and tell us that it really helps make their relationship stronger. Jonathan has been a trained Prepare/Enrich Facilitator for more than ten years and every single couple we've worked with has found it valuable for their marriage. Okay, there was one who didn't really like it. Ask us about them. :) We can take as much time as you want processing your P/E relationship assessment. For most of our couples, we hit the P/E highlights and cover the details of their ceremony in one brief conversation (face-to-face, Skype, or FaceTime). When Kathy officiates, we get together as couples to talk about your P/﻿E report and workbook. No counseling required. Just great resources at no extra charge. Check out the Prepare/Enrich ﻿link for more details. Where can we have our service? Use your imagination! Anywhere you desire (within legal and safety realities, of course). If you need help locating a venue, just let us know. We've officiated services at Castle Farms, The Perry, Bay Harbor and other professional wedding sites, at historic lighthouses, in churches, on the beach, and at private homes. Mileage beyond local travel (25 miles from Charlevoix) will be negotiated at booking. Also, Jonathan is currently the pastor of Greensky Hill Indian United Methodist Church so we have access to a beautiful, historic, hewn-log church in the woods for smaller weddings (or up to 250 for outdoor ceremonies) with a beautiful hall for receptions. Do you have any requirements for the couples you work with? What attire do you typically wear for a ceremony? Should something unexpected happen, what is your backup plan? ﻿That's never happened to us and it's highly unlikely since we live in Charlevoix (about 4 miles from Castle Farms). Since Kathryn Ann Mays is also a Professional Wedding Officiant, we cover for each other. 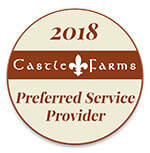 Plus, Castle Farms has staff on-hand who are licensed to officiate in case of just such an emergency. For other venues, we work with professional colleagues to make sure our couples are covered. Do you require a contract? What's the fine print? Our email/text communications and the payment and receipt of funds for services constitute a legal contract and the terms herein apply to all clients; however, we do provide a signed written contract to all couples. Ceremony date/time shall be reserved upon receipt of the non-refundable reservation fee (50% of total). Balance due is payable no later than one week before the ceremony. All-inclusive package: Officiant agrees to provide personalized wedding ceremony, professional officiating, Prepare/Enrich Relationship Inventory and Couple's Workbook, face-to-face and/or virtual marriage consultation, rehearsal (when desired), local travel (25 miles from Charlevoix), and professional referrals (upon request). Ceremony-only package: Officiant agrees to provide personalized wedding ceremony, 1/2 hour virtual rehearsal, professional officiating, and local travel. Extra travel is negotiable. Officiant shall arrive at the rehearsal (when included) on time and at least 15 minutes before the ceremony start time. Clients agree to adhere to scheduled times as Officiant may have a wedding or rehearsal scheduled within one-hour of contracted times. Officiant may extend times if possible; however, Officiant will be held harmless if delays make it impossible for Officiant to complete services. Clients are solely responsible for obtaining a legal marriage license in a timely manner and bringing it to the rehearsal/ceremony. Officiant is responsible for submitting signed license within 10 days to the county of license. In the event that Officiant is unable to perform the ceremony due to illness, hospitalization, family emergency, transportation breakdown, or any other unforeseeable cause, every reasonable effort will be made to notify Clients and provide a suitable replacement. Replacement Officiant shall be accepted as satisfactory fulfillment of contract. If a replacement Officiant is not possible, Clients will receive a full refund for all pre-paid services and Clients agree that Officiant will not be held liable for any damages (including punitive) due to the non-performance of the ceremony. If Clients cancel the ceremony for any reason, more than 180 days before the scheduled ceremony date and time, Clients agree to forfeit the reservation fee, all services will terminate, and clients who paid in full in advance will receive a 50% refund. If Clients cancel the ceremony, for any reason, within 180 days of the scheduled ceremony date and time, Clients agree to forfeit the full fee, all services will terminate, and no refund will be issued. When Clients are responsible for cancellation within 180 days, Clients agree to payment in full to Officiant as liquidated damages and not as a penalty. Clients and Officiant agree that such an amount is reasonable for the resulting likelihood that Officiant will not be able to replace the cancelled reservation within that time frame. IN WITNESS WHEREOF, the parties hereto agree to the terms and conditions as described above and have caused this Contract to be effective on the date of reservation. The parties agree that the specifics of the ceremony will be approved by Clients and Officiant. How do we secure your services and book a date? ﻿Just call or text (231) 459-8067 or use the Inquiry Form on our SERVICES page. Your date will be officially booked upon receipt of your non-refundable reservation fee. At that time, we'll email the first draft of your ceremony and, if you've selected our all-inclusive package, we'll send the link to your P/E relationship inventory and schedule time to talk about the inventory and workbook and details of the ceremony. When you say yes, we hold your date in our schedule for one week to give you plenty of time to submit your non-refundable reservation fee.